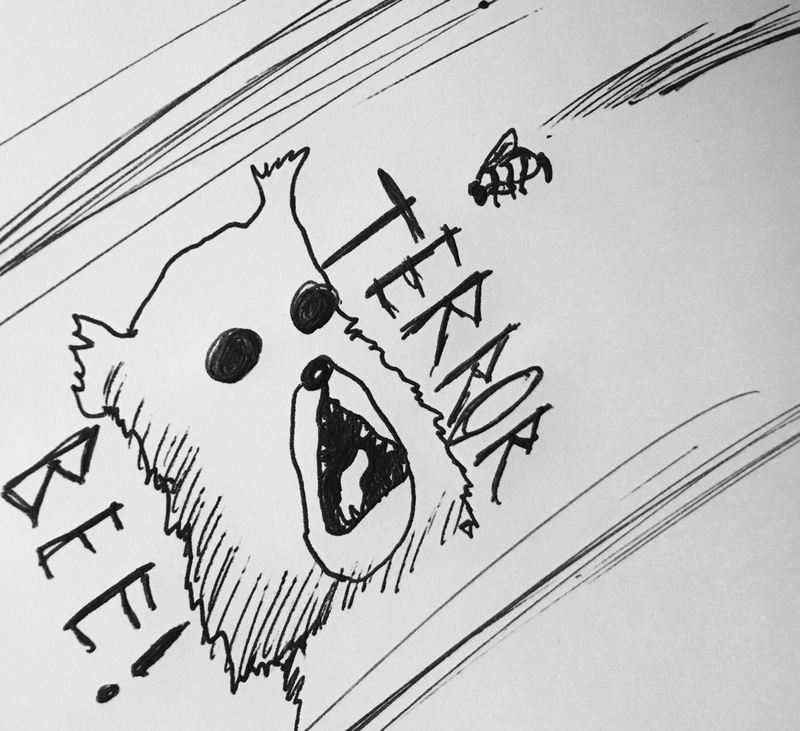 How I handled a bee I saw after it saw me: a series of mistakes that led to a strange triumph. As the air gets warmer and the forest gets greener, it is clear that spring is shaking the forest loose from the harsh, extensive grip that winter sometimes seems to have. It is, generally speaking, a welcome change in my daily forest interactions. The mud from the rain is nice. The air is warm but not wet yet. Trees seem to enjoy it. Flowers certainly do (and you can eat those, which is a bonus). The forest seems slightly more pleasant in the spring than it does during other times of the year. Until you see a bee. I have seen a great many bees in my lifetime, and bees and I generally have an understanding: I will keep sniffing things and ignoring you and you will keep being a bee and ignoring me. It is reasonable to me, and most bees are quite polite about the policy. It is best, for all creatures involved, if we ignore one another. Today, though, I admit, I failed. I failed to ignore a bee. And then it saw me, its deep, midnight gaze piercing through my very bearness, tearing its way through everything I have ever thought I was. That moment lasted a small eternity, if that is possible. In that moment, I obsessed over the worst possible thing that could happen as a result of this encounter: stinging things. If you have never been stung by a bee, consider your life a lucky, fulfilled one because being stung by a bee might be the worst thing that can happen to anyone who encounters a bee. It is such a devastating, awful event that when a bee stings you, it rids itself from the forest entirely, likely because of the guilt it feels for bringing such terror to another creature’s life. I did not want to get stung. And I did not want this bee not be a bee anymore (even if it was terrorizing every bit of my sensibilities). I did what any normal creature would do… I yelled at the bee. I was hoping this would scare the bee, but it only yelled back, its harsh buzzing sounds echoing through my fuzzy ears, a shrill reminder of the pain to come after the inevitable stinging. So… I did what any normal creature would do after yelling at something with no success… I ran at it… In the moment, it felt like the right thing to do. I knew I was much larger than a bee, so I figured it would be terrified of my largeness multiplied by my speed. I panicked. I ran. I shook my face violently. And then I spit. The bee hit the ground, covered in my saliva. I felt terrible. What had I done to this poor bee, its only crime being its sight of me? Its tiny wings fluttered, shook my spit from it, and it unceremoniously took flight. Before I could ask for its forgiveness, it was gone, back in the depths of forest it came from, away from me. I was shaken by the event. I felt a strange mix of guilt and triumph. I fought a bee, which usually ends with at least one causality, and we both lived to tell the tale. And I think I even won. This entry was posted in Adventures and tagged @a_single_bear, bear blog, bear stuff, bear things, bears, bees, fun, humor, nature, tags, the forest, trees, twitter, yay on April 10, 2017 by A bear. You are a bear. Do not get ants in your nose. You are a bear. Living in the forest provides you with an array of fascinating smells, sights, and food. You live for the eclectic forest experiences that you collect on a daily basis. Every tree stump, abandoned cave, riverbed, bushel, and strange human structure offers a unique, amazing sensory overload. Among these fascinating structures: an anthill. You have never licked, smelled, clawed at, or even thought too deeply of anthills. Before today, you had never even seen an anthill that was idle, without ants. This anthill currently has no ants rummaging around the top of it. It is idle. Without ants. At least ones you can see. It is a very nice anthill. This entry was posted in Adventures and tagged ant adventure, ants, bears, choices, choose your own adventure, etc, humor, nature, the forest on August 7, 2016 by A bear.